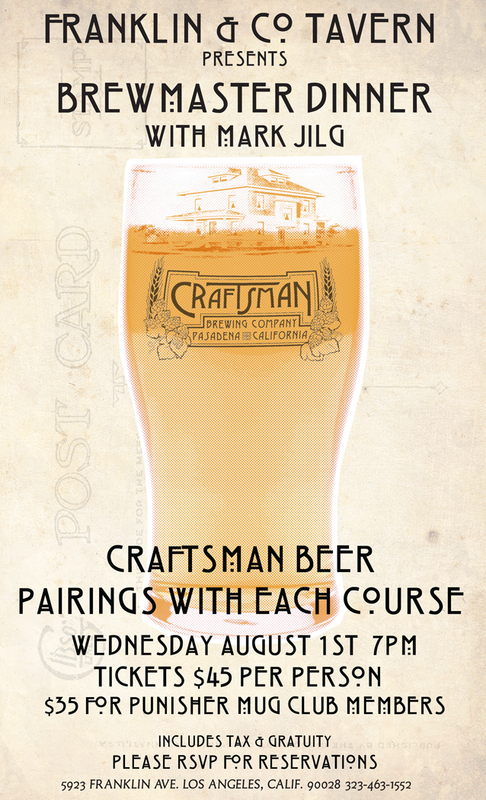 This will be the first brewmaster dinner Franklin & Company has arranged and there is no better brewer to kick it off then Mark Jilg of Craftsman Brewing in Pasadena. The meal will be four beers paired with a four course meal for $45 per person with introductions by Mark and Chef Jared Combs of Franklin & Company Tavern on Wednesday, August 1st at 7PM. The menu for the evening is in the works and will be posted online shortly. Please r.s.v.p to events@franklinandcotavern.com to reserve your seat! This Wednesday, July 18th at 8PM our good friends at Angel City Brewery will be hosting a beer education and tasting night at Franklin & Company Tavern! Aside from pouring their Angel City Test Batch "B" they will also have some keychains and swag for prizes on their wheel (people can spin the wheel and win anything from a high five to a pint glass) as well as ingredients they use in the beer for customers to see, smell, taste, etc… This is a great chance to meet and greet with Los Angeles's newest craft brewery! For the beer geeks, Rumor has it that the founders of Alchemy & Science, the craft beer collaboration that has purchased Angel City Brewery led by Alan Newman & Stacey Steinmetz might be in attendance.